Over 150 million animals are killed for food around the world every day—just on land. That comes out to 56 billion land animals killed per year. Including wild caught and farmed fishes, we get a daily total closer to 3 billion animals killed. In the United States alone, around 9 billion chickens hatch every year for the sole purpose of growing to an edible size and dying for human consumption. Animal suffering is the most direct consequence of consuming meat, but there are unintended consequences of eating animals, too. This video is disturbing. Some fish survive out of water for hours covered in ice on their way to the slaughterhouse. If they’re still breathing, they die by blow to the head. Nearly 300 wild sea animals are killed every year to feed one American, but that doesn’t include the fishing industry’s bycatch. What is bycatch? And why are we catching so much of it? Bycatch is the total number of sea animals fishermen unintentionally catch in their nets and kill. They are usually found tangled in large shrimp trawler nets and discarded dead or dying back into the ocean. If you add the bycatch to the total number of sea animals killed per person per year, which can be as many as 300 sea animals, you end up with a number closer to 500 sea animals killed per year to feed one person. The majority of the world’s bycatch are anchovies and krill. All bycatch combined weighs out to about 150,000 metric tons per year. The manner in which fish are unintentionally caught varies by species. Dolphins are often caught in tuna nets, and turtles are frequently hooked by fishermen. Many of these “accidental” catches get thrown back into the ocean dead. Shrimp trawler nets wreak havoc on marine life. Two-thirds of the animals caught in them are considered bycatch and discarded. The nets themselves are massive with fine webbing that sweeps up crustaceans and small fish, as well as stingrays and sharks, from their natural habitat and pulls them aboard. Most fish killed for food die by asphyxiation, and the rest are gutted alive. Death times range from 25-250 minutes. Footage of swordfishing driftnets unintentionally catch dolphins, stingrays, and sharks of the coast of California surfaced a few months ago. Needless to say, it was time for them to go. Gov. Jerry Brown ended the use of swordfishing driftnets in September. While the bycatch numbers seem like they are the entire source of the problem, there’s another dark corner of the industrial fishing industry. Much of the demand for animal feed falls on the fishing industry. About half (46.8%) of all animals we kill for food are referred to as “feed fish.” Billions of feed fish are caught in the wild every year to feed pigs, chickens, and farmed fish. Yes, we kill fish—a lot of fish—to feed the fish we eat. We kill billions of wild fish, but fish are not always considered the easiest animal to sympathize with. Let’s not complicate the simple fact. There is no such thing as humane slaughter. And that goes for every living animal. Considering the number of Americans that claim they only eat humane meat, it’s worth a quick math lesson. If 99% of farm animals in the U.S. are raised on factory farms, compared to about 90% globally, and 75% of Americans think they consume humane meat, the survey says that most of them don’t. It’s almost impossible to know what cage-free chickens look like until you’ve been to the actual farm. And we have the factory farms themselves to thank for that. Transparency is not their strong suit. So, what are they hiding? Factory farms are hiding suffering animals behind deceptive labels like “cage-free” and “humane meat.” Most of the time, cage-free does not mean healthy or happy. It doesn’t even mean they live outside. Even those with the best reputations and highest certifications and awards for their humane treatment of animals still have suffering animals on their farms. Animals raised for food die by the millions in slaughterhouses around the world. The idea of a life lived in a long line of animals waiting to be killed can feel out of reach, which is why we chose to include some of the more disturbing images from factory farms in this article. Killing animals for human consumption is not a necessary evil. As Jacy Reese, author of The End of Animal Farming, puts it, humane animal farming cannot feed 10 billion people by 2050, and the cycle of violence towards animals has to end. Suffering is in the DNA of animal farming. Calling it humane, however humane it actually is, won’t change that. The more you think about it, the easier it is to come to terms with the fact that humane meat is an oxymoron. The word humane means to have or show compassion, but there is no compassion to be found in any slaughterhouse anywhere that will end the suffering of animals everywhere. Suffering is the common thread for every animal killed for food, many of which see life as they know it end in a windowless slaughterhouse. But the distribution of animals killed for food every day might not break down the way you’d expect. If you’re a meat eater in the U.S., you probably eat a lot of chicken (number two on the list) and a lot of beef. 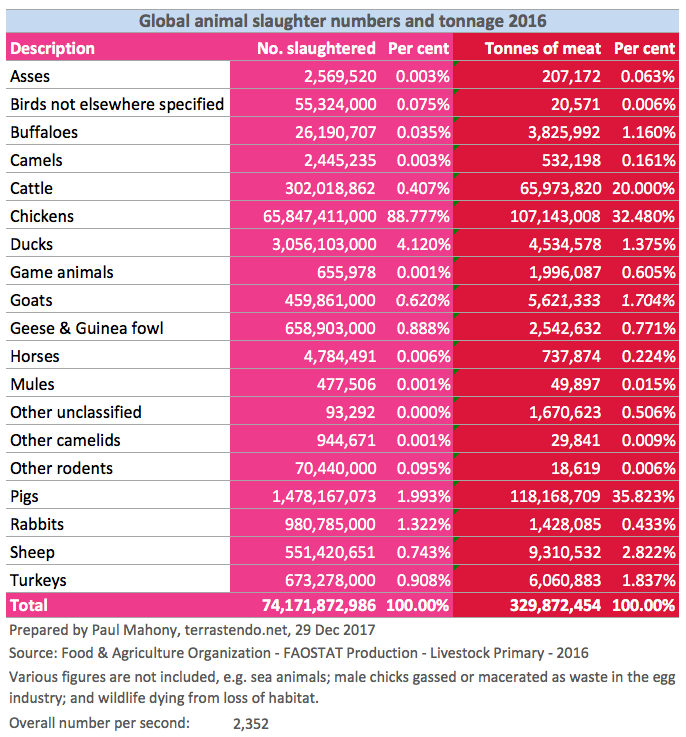 Here’s how the number of animals killed for food every day breaks down. Wild fish. An estimated 7.3 billion wild fish are killed for food every day. That number includes some bycatch and feed fish. While it seems extraordinarily large, in reality, it may be even higher. The commercial fishing industry does not report bycatch numbers. The report total weight caught. Many fish are thrown back, often to avoid going over their boat’s quota. So, all wild fishing numbers should be taken lightly until more comprehensive research is done. We chose to include a much more conservative estimate when calculating the total animals killed for food every day for this reason. Chickens. Some 9 billion broiler chickens hatch every year in the U.S. (and about 65,847,411,000 worldwide) Almost all broiler chickens will one day become meat, subtracting those that do not live to see the slaughterhouse. On average, about 25,000,000 die every day in U.S. Sellers often report total weight, which ranges from the live weight of the bird to something called carcass weight, which is the weight of the animal after the slaughterhouse separates parts deemed inedible like the head and internal organs. Farmed fish. More than 300 million farmed fish are killed for food every day. This total does not include the wild-caught feed fished killed to feed fish on factory farms. Tuna and salmon need to eat at least five pounds of feed fish for every pound of body weight. Like other factory farmed animals, farmed fish live their lives covered in a toxic mix of their own waste and that of their neighbors. Ducks. Around the world, about 11 million ducks are killed daily. That does not account for the ducks who, having developed a neurological disorder from living in such close quarters to one another, start to pull out their own feather and peck other ducks. Factory farmers cut off these ducks’ sensitive upper beak. Many get infected and cause the ducks to starve themselves and die. Pigs. PETA estimates that 121 million pigs are killed for food in the U.S. every year. 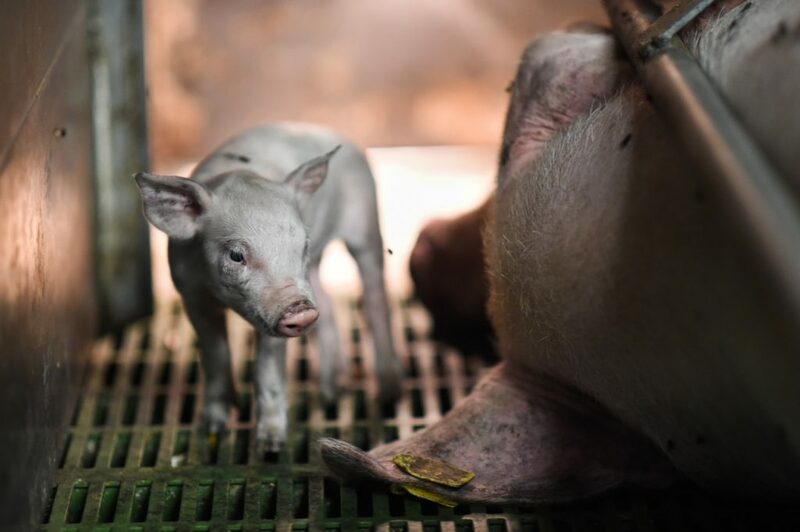 Piglets are separated from their mothers as young as 10 days old. Mother pigs, called sows, give birth without rest of space to turn their bodies around for up to four years before they’re slaughtered. Piglets are moved to pens where they grow to about 100 pounds. Farmers then move the piglets, called feeder pigs, to corn farming states like Illinois and Indiana, where pigs reach market weight (about 300 pounds). In the back of crowded trucks on the way to slaughter, up to 1 million pigs die every year. Rabbits. Over 3 million rabbits are killed for food every day. For most Americans, rabbits are not food. They fall under the sympathetic animals category with house pets and furry companions. But in places like China, Italy, and France, rabbits are still farmed for food. Geese. Almost 2 million geese are killed for food around the world every day. Ducks and geese are also raised in large numbers for their feathers, and they happen to suffer one of the cruelest animal farming practices. Ducks and geese are force-fed and killed for their livers, which are enlarged from the excessive amounts of carbohydrates forced down their throats. So-called foie gras ducks and geese have a mortality rate 20 times higher than ducks and geese raised for meat and feathers. Turkeys. Americans consume an average of 71 turkeys in their lifetime. That compares to 31 pigs, 10 cows, and more than 2,000 chickens. About 736,000 turkeys are killed every day for food in the U.S. Because of heightened demand for meat, turkeys are getting bigger (57% between 1965-2000) and more sedentary, as a result. At that size, factory-farmed turkeys physically cannot run or fly like they would in the wild, despite their driving urge to do so. Sheep. Globally, more than 500 million sheep are killed for food every year. Many of these animals die while they are still babies. Lamb refers to any sheep younger than one-year-old. Some lambs are slaughtered as young as two months old. In commercial slaughterhouses, workers shackle the lamb’s hind leg and raise it up off the ground. The lamb is cut from stomach to throat and left to bleed to death, often still conscious. Goats. About 1.2 million goats are killed for food around the world every day. Female goats are forcibly impregnated to produce milk for dairy farmers. Because male goats cannot produce milk, farmers often slaughter them at birth. Cattle. Per head of cattle, beef doesn’t even break the top 10 in animals killed every day. The difference in the number of cows killed for food every day is largely due to the size of the animal. In the U.S., 182 chickens have to die to replace the meat produced by slaughtering one cow. Female cows are forcibly impregnated, their young taken away to be slaughtered immediately. Some of put in a tiny shed and fed a low-iron diet until they become anemic and can be slaughtered and sold as veal. Dairy farmers milk female cows until they can no longer stand under their own power. Then they are dragged to auction and die. On average, more than 800,000 cows are killed for food every day. Last month, DuBreton, a farming operation providing Certified Humane and organic pork to millions of people around the world, invested $40 million into establishing more humane farming practices since 2015. The network of more than 300 family farms has now raised 340,000 pigs without the use of crates. DuBreton’s welfare initiative represents one of the largest goals ever set by the animal agriculture industry. It provides customers with the opportunity to support the humane treatment of animals with their everyday purchases. But it also solidifies the farm’s position in the market. That lot of 340,000 pigs will probably stay that big, maybe even grow in the wake of such seemingly positive news. Progress is progress. We are always ready to acknowledge that. But to end farm animal suffering, we have to do better than support the humane treatment of animals with everyday purchases at the grocery store. We have to end animal farming entirely. If we’re being realistic, entirely is a stretch. It’s meant to show what it takes to love all animals, regardless of the base level of compassion we might feel towards a few. Every sentient being on the planet deserves a chance at life, and those kinds of changes will not be coming from a world that kills trillions of animals—even feeds animals other animals—so that we can eat. Humans for a more humane world, not more humane farming practices. That’s what we’re looking for: a world full of the kind of compassion that cannot even think of killing an animal. All a truly compassionate world can think of is life in all its forms.